If employees are not engaged, CSR becomes an exercise in public relations. CSR strategies, sustainability reports and the integration of ecological and social values in vision and mission are very often addressed to external stakeholder groups rather than to one of the key stakeholders of a company: it’s employees. It is a missed opportunity if own employees don’t know what is going on, as they are the most valuable brand advocates of a company and CSR measurements are becoming more credible for external stakeholders when shared by all employees. CSR – HR = PR. 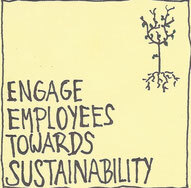 If employees are not engaged, Corporate Social Responsibility becomes an exercise in public relations. The credibility of an organisation will become damaged when it becomes evident that a company is not ‘walking the talk’. Although the role that employees play in CSR and sustainability is increasingly recognised, MIT Sloan Management Review reported that only 37% of employees surveyed were even aware of their respective companies’ CSR programs. The research suggests that most employees are not close to their employer’s CSR efforts; while many have a vague notion that their employer is socially responsible, they know little to nothing about the specific activities the company is engaging in. The more substantial and straightforward the shift towards a sustainable business, the more important to work closely with employees and form a partnership that is based on honesty and transparency, creates value and is focussed on finding solutions together. Bob Doppelt, Executive Director of The Climate Leadership Initiative declared: employee engagement can be the difference between making sustainability stick and watching an important corporate strategy lose momentum and fizzle out over time. Treating employees as partners, asking for and listening to their considerations and concerns, motivating them to bring their ideas into an open space, giving them respect and trust in what they have to contribute, can be a major force to become a sustainable company. Involving employees in forming a CSR concept, in planning and finally in implementation make them participants and co-creators rather than spectators.